Henry Cowell Redwoods State Park offers recreation among a diverse landscape of beautiful forests, meadows and lush stream canyons. Photo by Jim Bahn, Flickr Creative Commons. Sheltered in the Santa Cruz Mountains, not far from the bustle of Silicon Valley, are some of the most beautiful old-growth redwood forests left in the region. With your support, the Santa Cruz Mountains Old-Growth Campaign is protecting the dramatic natural beauty and important wildlife habitat here, including 30,000 acres of redwood forests. Just 5 miles from Santa Cruz, Henry Cowell Redwoods State Park offers sunlit meadows, lush stream canyons, pine and oak forests and quiet walks through ancient redwoods. ACTIVITIES: Hiking, camping, picnicking, bicycling, horseback riding, nature programs and dog walking (on leash). Nearby Roaring Camp Railroad offers a Father’s Day barbecue ride (among other tours) of a local forest as well as transportation to the beach at Santa Cruz. MUST-SEE FEATURE: Ponderosa pine isn’t normally a coastal species. Yet this long-needled, orange-barked pine thrives in the rare inland marine deposits known as the “sandhill community” at Henry Cowell. HIDDEN GEM: If the main part of the park seems crowded, head northwest to explore the steep canyons and second-growth redwoods of the four-square-mile Fall Creek Unit. The lower elevations are particularly lush. Honor your dad and any other special men in your life and give the gift of redwoods this Father’s Day! Make a donation of $5 or more in honor of your loved ones and choose a beautiful redwoods ecard to send them. For just $25, you can give the gift of a League membership, and for $75 you can have a seedling planted. Thousands of nature enthusiasts like you recently joined Save the Redwoods League and other conservation organizations at BioBlitz to inventory the plant and animal species that live in Muir Woods National Monument and several national park sites. You can help with research like this anytime, anywhere. Sharing a border with San Mateo County’s Memorial Park and less than an hour from Silicon Valley‘s millions of people is a magical forest of big redwoods that’s practically ready for you to walk its wide, welcoming trails. The Loma Mar Redwoods forest in the Santa Cruz Mountains is a delight. You can protect and open this forest to the public. 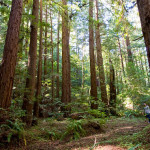 Learn more about Loma Mar Redwoods and our Emergency Projects Campaign.